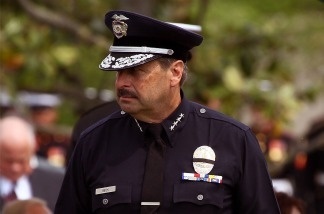 LAPD Chief Charlie Beck attends the burial service of Sgt. Maj. Robert Cottle, a member of the Marine Corps reserve and LAPD SWAT team killed in Afghanistan, at Arlington National Cemetery April 16, 2010. LAPD Chief Charlie Beck has been in the job for just over a year, and he can point to a decline in crime, with a homicide rate for 2010 that has dropped to the level of 1967, as a validation of his policing methods. But gang units being dismantled, diminishing budgets, charges of racial profiling on the part of LAPD officers and controversies over the use of deadly force continue to dog his efforts to raise morale and keep crime rates low. You can ask the hard questions about these issues and more as the chief joins Patt for our regular Q&A. LAPD Chief Charlie Beck says he doesn't expect an Arizona-style immigration law in L.A.